Estimates vary, but the conclusion is the same: workers are spending more and more time searching for information, duplicating their own work or that of others because they can’t find the document they need, and employers are wasting billions of dollars per year on lost productivity. Quandora conducted a survey of its members in 2015 and found that the average worker spends 2h/day searching for info. McKinsey cited a similar statistic (1.8h/d) which translates to 1 out of every 5 workers spending their time searching and basically not contributing any value. In 2016, IDC forecast a 60-fold increase in the number of accessible files by 2020 and cited that knowledge workers were spending an average of 8.8h/wk searching for info, which correlates to employers spending about $14,000/yr/worker on search time. BAE Systems did an audit in 2016 and found that their engineers were spending at least 1h/d duplicating work because they couldn’t find or didn’t know that the work was contained in another document, wasting over $5M/yr in duplication time. Last year, in 2017, nearly 3.3 million scientific and technical articles were published and SearchYourCloud recently surveyed that workers required an average of 8 searches to find the right document or information they were seeking. This is crazy. Calculating the lost opportunity cost in science is more difficult. How do scientists keep up with the literature, daily news alerts and everything going on in the field – and peripherally around it? How much time is wasted trying to construct a Boolean query for a complex search or waiting in the queue of a data scientist to get the search results requested? And what happens when that one key paper is missed …? 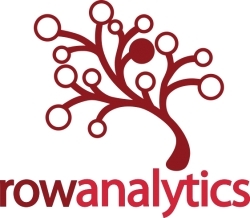 RowAnalytics set out to solve the major problems with search engines. First, removing the requirement that the user knows all the “right” keywords and has the uncommon expertise to build this and/or “not that” Boolean style complex searches. Now, entire sentences or abstracts can be pasted or whole articles and/or patents together can be directly uploaded into the query field. The AI find engine constructs the query on behalf of the user and retrieves all the hits that match, as well as returns interesting hits that keyword searches miss. This is especially helpful when preparing a patent claim or new drug filing when much of the language is deliberately obfuscated – precisionlife SEARCH determines which other patent applications (or articles) are similar in concept. Second, avoiding the high cost of manual ontology curation, the tedium of data training, the frequently missed/wrong tags, and challenge of scaling. Deployment is now easy via automatic incremental indexing, requires no training, enables rapid adoption and keeps the computational demands minimal. Document clustering enables scaling to billions of documents and tens of millions of terms on affordable servers. Third, there was a great need to enable researchers to stay current on the literature without having to set up alerts on multiple sites and be bombarded by large numbers of ‘not quite right’ papers. The “Research Channels” feature allows users to easily save and share any of the search results as a permanent link. Plus, favorite papers can be assigned a “star” and saved to a personal reading list. RowAnalytics is an A.I. solutions company innovating high-dimensional analytics to solve grand challenges in health, food and smart living. Our precisionLIFE platform powers massive disease population studies to identify novel associations of multiple genomic, phenotypic and clinical factors in parallel to assess disease risk and predict therapeutic response. Our platform is a remarkable new capability in precision medicine with unprecedented scale and speed to identify biomarkers, find new purposes for existing drugs and to identify those patients most likely to respond to treatment. RowAnalytics’ solutions provide personalization at the scale required to deliver next generation precision medicine, digital health and smart IoT solutions. Headquartered in Oxford, UK, with offices in Copenhagen, DK, Warsaw, PL and Cambridge, MA, RowAnalytics was founded by a diverse team of highly experienced life science, healthcare, A.I. and computer science leaders.